Give yourself a bit of retail therapy at Market Square Kauppatori and Kamppi Shopping Centre. 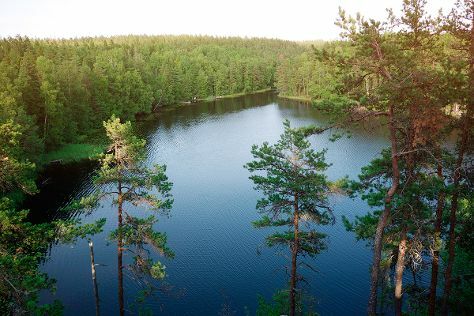 Visiting Nuuksio National Park and Niivermaki Nature Conservation Area will get you outdoors. You'll find plenty of places to visit near Helsinki: Teijo national park (in Pernio), Vantaa (Sipoonkorven Kansallispuisto & Jumbo Shopping Center) and Kotka (Beach Mansikkalahti & Linden Esplanade). And it doesn't end there: take in the spiritual surroundings of Rock Church, look for all kinds of wild species at Arboretum Mustila, contemplate the long history of Seurasaari Island and Open-Air Museum, and take in the architecture and atmosphere at Helsinki Cathedral. To find photos, ratings, maps, and other tourist information, refer to the Helsinki online attractions planner . If you are flying in from Belgium, the closest major airport is Helsinki Vantaa Airport. In September in Helsinki, expect temperatures between 19°C during the day and 8°C at night. Finish your sightseeing early on the 19th (Thu) to allow enough time to travel back home.